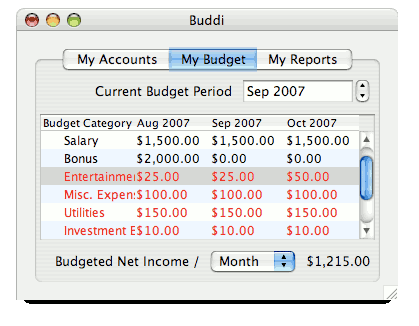 Buddi is released as Open Source Software. You can download it for free, with no disabled features and no time limit. If you find that you like it, and that it has helped you to organize your finances, I would greatly appreciate a small donation via the link at the bottom of the page. I have spent thousands of hours of my own time perfecting Buddi - while I am not doing this for the money, I do need to support myself and my family, and every little bit helps. Buddi will run on almost any computer which has a Java virtual machine installed (Java 1.6 or higher is required for current versions of Buddi; see the Download page for details). This can include Windows, Macintosh OS X, Linux, and many other operating systems.